When my kids were younger, I belonged to a Bunco group. It was an excuse for a dozen women to get together once a month to eat, drink, eat, gab, and did I say eat? And oh yeah, there was a mindless dice game thrown in for good measure. The group fizzled out after a few years, but I still have a bunch of fun memories, not to mention good recipes, from our time together. Here's an easy recipe that I got from with Jodi, one of the better cooks of the bunch. I like taking it to cookouts because it doesn't get soggy as quickly as a tossed salad will. The honey roasted peanuts are the ingredient that elicit remarks like, "mmm .... who brought this salad?" Mix together the ingredients for the dressing ahead of time. 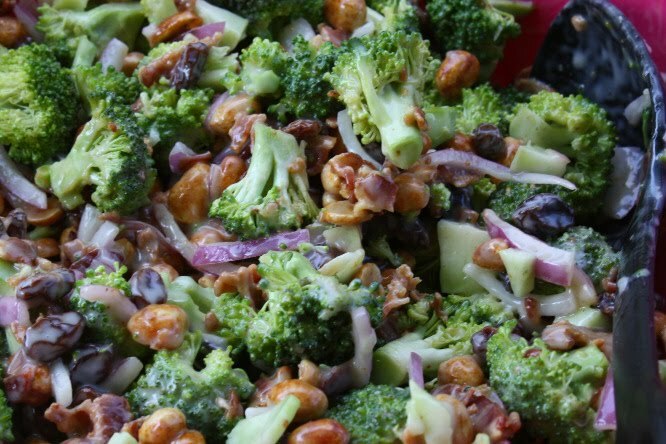 Twenty minutes before serving, combine the onion, broccoli, bacon and salad dressing. Mix well. Garnish with the honey roasted peanuts just before serving. Yum. 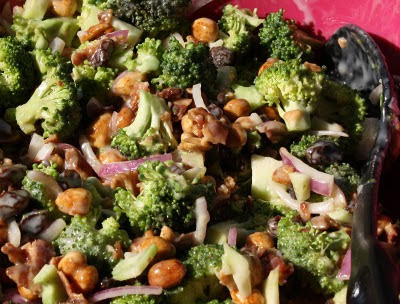 This salad looks great, too! I would play bunco with you. Sounds like a good time... I've never played before. I could bring over my limoncello.